This page has picture of the outside of the Louve, the Tuileries Gardens, and the now destroyed Tuileries Palace. This page also has information for your visit to the Louvre. Click on Mona's face after you have viewed this page to view what to see once you are inside the Louvre! The Louvre opens at 9:00. If you decide to arrive right at 9:00, get off at the Palais Royale station, cross the street, go through the archway and you can go right in the special entrance for Museum pass holders. My preference would be to leave at about 7:30. Take the subway to the Concorde station. 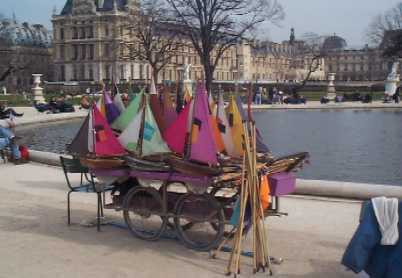 You can walk to see the Egyptian Obelesk, then walk through the Tuileries gardens to the Louvre. If you still have time before 9:00 you can check out the inner courtyard before you go in. 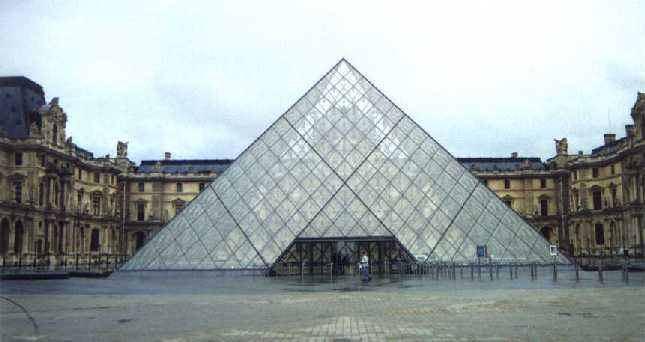 The Louvre is the largest and most famous museum in the world. It used to be the palace of the French Kings. Louis XIV built Versailles in the late 1600s and moved there along with his Court. It was built over a period of 500 odd years. 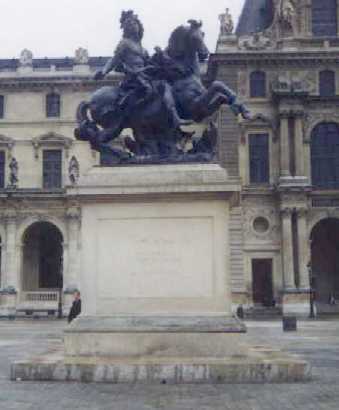 By the Pyramid entrance is Louis XIV on the horse. Its a copy of the statue Bernini made for him that is at Versailles. Louis hated the statue and it is put way out at the end of the South Parterre. Notice all the nice statues that are everywhere built right into the walls. You should allocate a minimum of 4 or 5 hours. If you don't have 4 or 5 hours, don't go. I would recommend that you go on a guided tour or take the audio tour. This is a little handset that tells you where to walk and describes what is in that room. If you plan to be in Paris for a week, you should go a couple of times. It always takes me a few minutes to figure out where I am because the first floor is not the ground floor. On the pamphlet the Entresol level is the basement, The ground floor is what we would call the first floor, the first floor is what we call the second, etc. Once you find something that is on the map, you will be all set. Ask for directions if you have to. If you decide to skip the guided or audio tour, I would recommend that you start in the "Denon Wing" and walk the ground and first floor. See the Mona Lisa early before the crowds arrive. The Apollo Gallery is room that must be seen. This is where the French Crown Jewels along with may Object's d'Art are kept. Next go to the Sully Wing. Again, the ground and 1st floors are the best. Rooms 20 through 30 on the first floor and 2 through 12 are the best. On the 2nd floor there are some great paintings all the way around the Sully wing. Last go to the Richelieu Wing. On the 2nd floor somewhere are all the Rembrandts. If you are tired of paintings at this point skip the 2nd floor. On the ground floor be sure to go see the statues in the Cour Marley. Make sure you notice the cielings and architecture of the building when you are walking around. Be sure to go in the Greek and Egyptian areas. It is amazing what the French have stolen over the years. Above is the Tuileries Palace. This was formerly the residence of the Royal Family before Louis XIV moved them to Versailles. 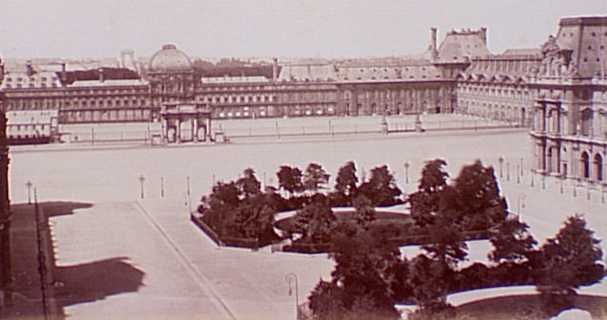 This part of the Louvre was burned and destroyed during the Commune of 1870-1871. It actually was pretty much looted during the revolution of 1838 (Les Misérables time), but Napoléon III had it restored in Second Empire grandeur. The charred remains of the Palace remained for 12 years before they were torn down for the gardens to give the wonderful view through the Arc du Carousel through to the Arc de Triomphe and beyond to La Défense. The trees in the foreground are where the glass pyramid is now located. This view is towards the Champs Elysees. 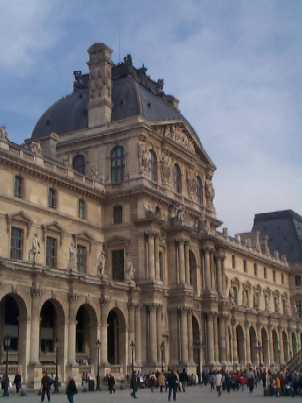 Below is the main entrance to the Louvre.